Is a healthcare apprenticeship right for you? How does an arrangement where you have the opportunity to get paid while also learning career-advancing skills sound to you? Too good to be true? Well it’s not. 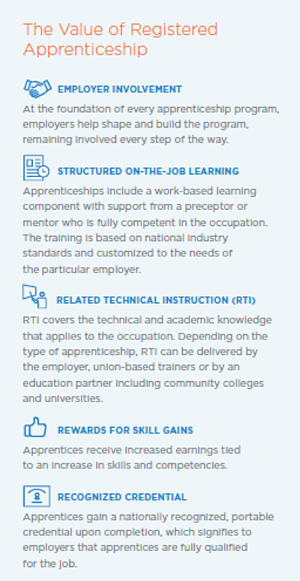 This describes the apprenticeship model which includes a paid-work component plus an educational or instructional component where you can obtain workplace-relevant knowledge and skills. Registered Apprenticeship programs are high-quality, work-based learning and post-secondary, earn-and-learn models that meet national standards for registration with the U.S. Department of Labor. You might think apprenticeships are just for manufacturing or trade areas, but now more than ever, organizations in other fields — including healthcare — are using the apprenticeship model to find workers and ensure they have the exact skills needed. The healthcare industry is facing complex workforce challenges, including a shortage of skilled workers. Current and projected talent shortages lessen the industry’s ability to keep pace with the growing demand. Wouldn’t you like the opportunity to land a well-paying healthcare job that allows for growth and advancement, without the worry of a potential higher-cost education? Apprenticeship is a win-win-win for workers, employers, and the community.